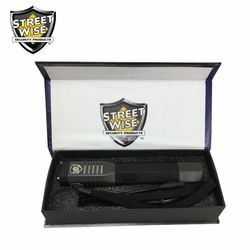 As one of our new Top Gun Models, the Lightning Rod 26,000,000 Stun Flashlight combines the latest XPE Cree Flashlight technology (increased brightness of the light) with a newly designed high voltage ignition coil (increased stun power) to create the next generation of high powered stun flashlights. 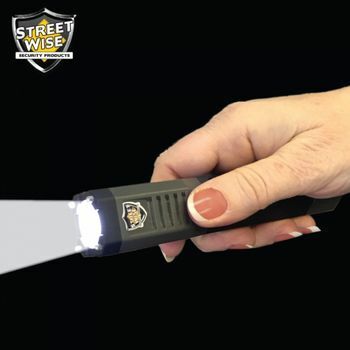 The power of this stun gun is 80% stronger than most models. Just test-firing this powerful unit is often enough to stop an attacker. If the sight and sound of the powerful electric charge doesn't stop him a jolt from this unit certainly will! 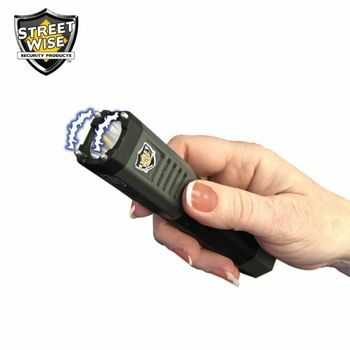 The 180 lumen XPE LED light is almost three times brighter than the light currently used in most stun guns. The Lightning Rod has five dynamic light modes: high, medium, low, strobe, and SOS. The ABS plastic shell protects the Lightning Rod from damage and the rubberized handle ensures a firm grip, while the square head prevents rolling. To make it easy to carry a wrist strap comes with the unit. The recharging cord (included) plugs into a standard wall outlet to save you money on batteries and protect the environment. The Lightning Rod is made of the highest quality components and comes with a lifetime warranty.